The all materials contained on this section, including but not limited to images, text, photographs, designs, icons and illustrations, except those already covered by existing copyright and intellectual property protections, are the property of Insignia Lab Solutions (hereafter "iLAB"), and/or its owners or affiliates. To reproduce, republish, alter, upload, post, transmit, distribute or publicly display material from this Site, you will need written permission from iLAB. The trademarks and logos used and displayed on this section is trademarks of iLAB and others. Users may view and download material from this Site only for personal, noncommercial use, and such permission is deemed adequate consideration for this contract. iLAB will aggressively enforce its intellectual property rights to the fullest extent of the law. Any rights not expressly guaranteed herein are reserved by iLAB. Go to Terms and Conditions for more about the intellectual property rights. iLAB Medix Peptide (Amino Tri-Peptide-3) is a synthetic protein that is a fragment of the C-terminal portion of collagen I, combined with Palmitic acid. It enhances the synthesis of collagen I, collagen III, and fibronectin. Studies show that it has a dramatic effect on reducing the quantity and depth of wrinkles, as well as improving skin’s surface smoothness. A major feature of youthful skin is its resiliency to physical stress. The collagen makeup of youthful skin is 70% Collagen III and 30% Collagen I. Collagen III has elastic properties, but aging replaces Collagen III with relatively inelastic Collagen I. Skin treated with iLAB Medix Peptide demonstrates a rebound in Collagen III levels and a reversal in collagen ratios consistent with youthful skin. The cosmetic result is progressive improvement in skin tone and resiliency with ongoing treatment. iLAB Medix Peptide stimulates an increase in dermal proline levels and extensive new collagen production. After six weeks of regular treatment, the average increase in epidermal thickness, in both groups, measured by high frequency ultrasound, was 8%. iLAB Medix Peptide provides optimum skin nutrition to maintain healthy skin rejuvenation. iLAB Medix Peptide becomes continually more effective as skin matures. Recent discoveries have shown that hydralytic fraction of the native collagen strand-a peptide signal sequence-in capable of stimulating the growth of fiberblasr-like cells and industry collagen synthesis. Modification of this peptide sequence generated a novel peptide signal sequence, which in turn was complexed to two cofactors known to be integral components in the collagen synthetic pathway; namely, ascorbic palmitale and electron iron. The complex is named GC-100, which is tetra-peptide. The standard consequence of exposure to GC-100 are best illustrated in-vitro with the proline incorporation assay. Since proline is an integral amino acid of collagen, quantification of proline incorporation may be used to measure potential collagen deposition stimulated by GC-100. 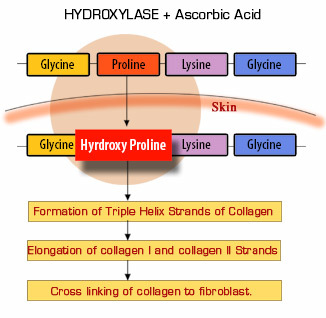 Hydroxylated and start the production of native collagen is assessed by the incorporation of radio active proline which is one of the four Amino acids of GC-100. Researchers state that GC-100 is five times as effective as Retin-A at decreasing lines, wrinkles, and blemishes. Cell respiration is a process of delivering oxygen and nutrients to the skin, while washing away toxic elements before damage occurs. Increasing cell respiration is vital for the health of the skin. Over the years, some have experimented with increasing cell respiration and blood flow by incorporating niacin, methyl nicotinate, capsaicin and others. While these ingredients may have delivered the increase in blood flow, they also faced the challenges of the adverse reaction of discomfort and irritation. Oxy Peptide provides the solution to increasing cell respiration, without irritation and without discomfort. Oxy Peptide is a bio-active cosmetic ingredient derived via biofermentation process, utilizing yeast derived complex which activates and reactivates tissue regeneration through a dramatic stimulation of cell respiration. Oxy Peptide is recommended for use in skin and body care products to support the skin’s natural revitalizing capacity and to strengthen against damaging insults. The effect on cell respiration was determined using a Gilson Respirometer IG-14 and a liver homogenate from a guinea pig. The Material increases the oxygen consumption of the liver cells in a dose-dependent manner, the optimal concentration under the test conditions used being 0.2 ml of the Oxy Peptide. The increase in oxygen consumption determined was 754%, when compared to the blank value. The cell renewal activity was studied with the standard dansyl chloride technique. Two test concentrations, 3% and 5%, were applied to the volar forearms of the test subjects twice daily for the duration of the study and then compared to an untreated site of the forearm. Twelve test subjects, ages 30 to 55, demonstrated an increase in cell renewal rates by 17% and 27% respectively. To test the ability on cell proliferation, the effect was detected in a cell culture system of Swiss 3T3 fibroblasts. A MTT assay was performed, which detects growth and mitochondiral activity of living cells. The Material was dose-dependent effect on the proliferation of an in vitro cell culture system. Treatment for bags, puffiness around the eye area. Helps prevent puffiness & reduce bags under the eyes. Increases the blood flow so quickly, instantly dark circles are gone. Di-Peptide 2 helps reduce puffiness and bags under the eyes. Poor drainage, fragile capillaries, and loss of elasticity due to fluid build-up cause puffy eyes. Fluid leaks into surrounding tissues and produces ”bags”. Di-Peptide 2 targets all three conditions by improving drainage, reducing capillary fragility, and reducing irritation and skin slackening while increasing skin firmness and elasticity. LipoPeptide with Lipase breaks the fat cells under the eyes and improves firmness and elasticity, decreases inflammation phenomena. And then lipopeptide with the sequence, Palmitoyl-Gly-Cln-Pro-Arg solubilised in a hydroglycolic excipient, delays the effects of premature aging, improves elasticity and firmness while hydrating, protecting and smoothing the skin and working similar to DHEA, which is known as the youth hormone. This peptide acts on a melostatin and the above complex helps to reduce melatin pigments, reduce UV, induce PGE2 enzyme level in Kerotinocytes and Fibroblast. This PGE2 enzyme can alleviate inflammation, which frequently results in vessel fragility. This condition can come to vascular areas of skin that is susceptible to discoloration. LipoPeptide helps reduce puffiness and bags under the eyes. Poor drainage, fragile capillaries, and loss of elasticity due to fluid build-up cause puffy eyes. Fluid leaks into surrounding tissues and produces ”bags”. This targets all three conditions by improving drainage, reducing capillary fragility, and reducing irritation and skin slackening while increasing skin firmness and elasticity. Emmax Peptide is the combination of Lipoprotein, DNA combined with RNA that is formed from Lipase being mixed with papain. It exfoliates the skin, dissolves the fat glands and reduces the activity of sebaceous gland while working as regulator of hormone activities by increasing T-Cell. Accordingly T-Cell gets turned on against the affected area only in an enlarged pore. As a second step, with more oxygen going into the skin, Lipoprotein fits into a receptor to help clean the skin area and fight bacterial while increasing immune responses without drying out the skin in other area. Meanwhile Salicylic Acid prevents clogging and also helps break down blackheads and whiteheads. This process results in pore reducing. HRM Peptide is the product of a deliberate investigation into the chemical signals that control the hair growth cycle. The application of these findings through our advances in peptide biochemistry offers a new beginning in hair restoration technology for both men and women. HRM Peptide is the first and only product in its class to directly stimulate the Anagenic Growth phase of the hair cycle with growth promoting growth factors for hair. The product is also first in its class to directly suppress the Catagenic Rest and Telogenic Loss phases of the hair cycle. The combined result is a hair restoration product that offers faster results with improved efficacy in problem treatment areas. Additional research focused on the hair growth cycle, with attention to the factors that create a hostile environment for hair maintenance and robust growth. Seborrhea and the scalp parasite Demodex are common stressors that are known to contribute to hair loss. Increasing the blood supply at the hair root has been shown to provide a nutrient-rich environment that favors hair growth. Each consideration has been addressed in the development of HRM Peptide. TA5 Peptide Formula™, is a powerful 60-amino acid protein chain, known as a Multi-peptide. TA5 Peptide Formula™ activates a specific receptor in the hypothalmus to produce growth hormone releasing factor (GHRF) which in turn stimulates the pituitary gland to release clinically significant quantities growth hormone and insulin-like growth factor (IGF-1) into the bloodstream. This has been proven in scientific studies. Unlike hGH, prolonged use of HTA Peptide Formula™ will not cause the body's own production of GH to shut down. In fact, many people use HTA Peptide Formula™ in conjunction with hGH treatment. TA5 Peptide Formula™ with TA5 is ideal for those individuals whose objective is to benefit from an increase in their body’s own release of GH without the risk of interfering with your body's own production and release of GH. In particular. TA5 Peptide Formula™ use will not suppress the body’s natural cyclical release of GH, as is commonly the case with GH injections. Consequently, you may start and stop the use of TA5 Peptide Formula™ without risk. TA5 Peptide Formula™ users can comfortably use HTA in the absence of physician supervision because TA5 does not expose the body to the pharmacologic concentrations of GH commonly used with GH injections. Copper Hexa Peptide are used clinically for wound healing, increased skin healing after laser resurfacing and chemical peels, and for improving the success of hair transplantation. They help stimulate the skin's regenerative processes which repair the skin's protective outer barrier, increase new capillary formation (angiogenesis), increase the production of collagen and elastin which improve skin elasticity and firmness, and the increase the water-holding proteoglycans and glycosaminoglycans (GAGs) which hold moisture in the skin and are the only "true" moisturizers of skin. They also activate the skin's system (called metalloproteinases) that removes damaged proteins such as in scars and sun damage marks.